NAMM 2011 PRESS RELEASE: SynthStation49 is the most advanced, intuitive music controller designed specifically for use with the iPad and the first true iPad performance tool for musicians. Working seamlessly with Akai Professional's heralded SynthStation software, SynthStation49 provides unparalleled music creation capabilities, including direct in-app MIDI recording from its velocity-sensitive keyboard, nine MPC-style drum pads and array of transport controls. In addition to its integration with the SynthStation app, SynthStation49 is also completely iOS CoreMIDI compatible, making it instantly compatible with dozens of music apps already in the App Store and hundreds more on the way. Dock, power and position the iPad perfectly using the adjustable-angled cradle, or establish commanding control over your favorite computer software using SynthStation49's USB/MIDI port. Professional 0.25" outputs and extreme portability ensure you'll be able to take your sequences straight to the stage at a moments notice. SynthStation49 is the only full-featured, professional keyboard controller allowing direct MIDI performance recording onto an iPad. Bridging Akai Professional's popular MPK controllers with the previously released SynthStation25, SynthStation49 provides immense software control with forty-nine, full-size velocity-sensitive keys, nine backlit MPC-style drum pads and full transport buttons. An adjustable-angled dock for iPad allows the user to easily slide their tablet into the SynthStation49's cradle and position the screen to their preference. SynthStation49's keyboard, pitch/modulation wheels and sustain pedal input provide great feel and the essential controls for musicians and producers to compose, record and perform. The nine drum pads of SynthStation49 give users immediate, intuitive beat-creation capabilities over the 50 classic and modern kits available within the SynthStation software. Program, Sequence, Song select and Transport buttons also provide quick navigation to the SynthStation App's most used components for a seamless, efficient workflow. SynthStation49 also contains a stereo pair of professional 0.25" TRS outputs with volume knob for easy connecting to other pro audio equipment on stage or in the studio. A headphone output also lets users practice and compose in private. The SynthStation49's USB port can be connected directly to a Mac or PC computer to receive power in addition to transmitting MIDI to and from music software - a great way to turn the SynthStation App or other CoreMIDI compatible App into a sound module. You can even use SynthStation49 as a traditional USB MIDI controller with your computer - no iPad required! 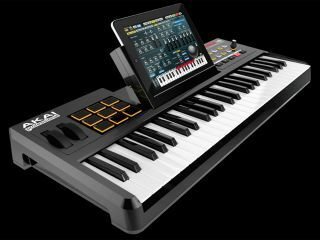 AkaiConnect SDK allows third-party developers to take advantage of all the professional controls and capabilities of Akai Pro's SynthStation49 keyboard controller and incorporate support for those controls within their iPad applications. Software developers interested in creating programs compatible with SynthStation49 can submit an application now at SynthStationApp.com.